Posted by dutchgrub	on Saturday, December 28, 2013 at 22:01. 2 Comments. The number of Michelin stars keeps growing in Amsterdam. It has gone up five years in a row now and reached a total of 15. The biggest contribution came from &samhoud places, which went straight to 2 stars thanks to its molecular gastronomy menu and ability to keep its stars after the move to Amsterdam. 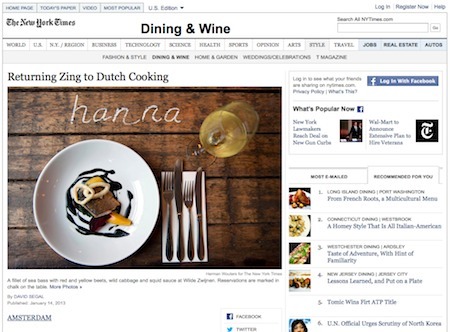 While there still is no three star restaurant, 2013 saw four with two stars: &samhoud places, Aan de Poel in Amstelveen, which went from 1 to 2, Ciel Bleu and Ron Blaauw. Then there are seven restaurants with one star, with Bord’Eau being the lone newcomer. It will be interesting to see if 2014 will be another year of additional Michelin stars for Amsterdam as Ron Blaauw has changed his formula and gone for great food in a less formal setting and Amsterdam would need to make up for two stars. Filed under amsterdam, michelin, restaurant. Posted by dutchgrub	on Friday, December 6, 2013 at 16:08. 0 Comments. Like every year, we are getting many requests for suggestions for Christmas Dinner in Amsterdam. So we have reached out to our favorite restaurants again and compiled a list of suggestions. Trendy French restaurant Bistrot Neuf, which among other things always impresses us as one of the few restaurants open every day, will be open for dinner on December 24, 25, and 26 with a special Christmas Menu full of classics like oysters, partridge or lobster. Marius and twin sister De Worst (Dutch for sausage), who are on our Best Amsterdam Restaurants list, are closed for dinner on Christmas, but have organized a festive Christmas lunch on December 24th and get a special mention. The lunch starts at 1pm at Marius, followed by the screening of the culinary movie Babette’s Feast, and then drinks and snacks at De Worst. The Okura Hotel with its range of restaurants including Michelin stars Ciel Bleu and Yamazato, is putting on a vast Christmas dining program. There’s a Christmas brunch, various dinners with special menus and much more. Another honorable mention for Restaurant Fyra, one of the restaurants we recommend on Sunday, another difficult day. They are closed on Christmas, but do offer a special sous-vide Christmas menu to take away and simply re-heat at home. 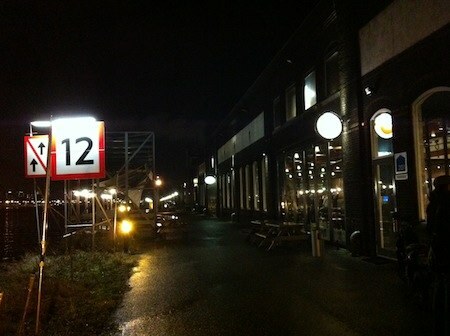 Fish restaurant Stork in the port of Amsterdam is open on boxing day, December 26th. Ron Gastrobar, the Michelin star turned informal restaurant with the same excellent food, will be open on December 24, 25, 26 with a special Christmas menu. While many restaurants are still closed around the holidays, it’s encouraging that we have six options this year compared to only three 12 months ago. So we are pleased to note that restaurants are responding to the demand for dining out on Christmas in Amsterdam. Filed under amsterdam, best amsterdam restaurants, christmas, dutchgrub, michelin, restaurant, trendiest amsterdam restaurants. Posted by dutchgrub	on Saturday, August 31, 2013 at 22:08. 3 Comments. Ron Blaauw is one of the most prolific Dutch chefs and one of the few to be decorated with two Michelin stars in Amsterdam. He maintained those stars for many years, first in picturesque Ouderkerk aan de Amstel just outside the city, then in Amsterdam proper after his move there. And then he did the unthinkable: He closed [Dutch] down the two Michelin star restaurant, only to re-open the next day at the same location, but with a different, less formal, menu and setting. And it worked beautifully! We’ve been on the record for preferring smaller, more personal, less formal and possibly more daring restaurants to the Michelin stars, especially those in hotels. So we were very pleased about the news and eager to try out the all new Ron Gastrobar. And we were not disappointed! The setting is chic and classy but not formal. The gastrobar takes no reservation, so we just walked in and were welcomed by the young and hip waiting staff. We were quickly shown our table and once seated happy to be greeted by the bartender. He came up with some great suggestions based on our preferences, not settling for safe choices but daring to pitch the unusual and set us up with a “Four More Years”, supposedly invented for Obama’s re-election and nicely combining gin, bubbly egg white and green sencha tea leaves. 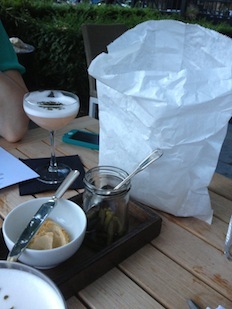 The cocktail plus the bread in a paper bag with nutty butter and pickles made us feel quite relaxed and inspired. Like the setting, the menu is very different from the formal Michelin style. It’s basically two pages of dishes at € 15,= each that you can mix and match any way you want. The dishes are a mix of French classics like oysters or a steak tartare, Asian dishes including sushi and also some fusion plates such as a Wagyu burger or grilled Chinese cabbage with marrow and sage. We went with two dishes per person, which was sufficient but left room for dessert. Another thing that we liked much better than at most Michelin star restaurants is the wine list. It’s much more modern with many interesting new world wines rather than pages of Bordeaux wines. The desserts are a similar mix of French classics and Asian influences, as well as cheese from our favorite cheese store L’Amuse just down the road. Overall, the food was great, in no way less quality than the Michelin star predecessor. 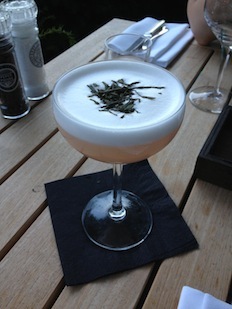 And we loved the casual atmosphere, service with a fun attitude and modern menu. Let’s hope this is a new trend! Open Monday to Sunday from 5:30pm. Filed under amsterdam, drinks, michelin, restaurant, service, wine. Posted by dutchgrub	on Sunday, July 14, 2013 at 17:06. 9 Comments. 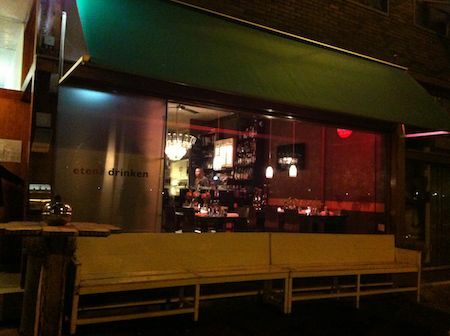 We’re very sad to see two of our favorite restaurants in Amsterdam close down. Both De Witte Uyl and Lovefood closed doors over the last weeks. De Witte Uyl had been on our list of Best Amsterdam Restaurants since 2009. And Lovefood was one of our Best Amsterdam Brunch places for the last three years. Our lists change rarely – it takes several extraordinary dinners before a restaurant is included. And the restaurants on the lists have shown amazing consistency in their quality. That makes it even harder to see two of them go. We’re incredibly thankful for all the hard work and uncompromising passion for good food that owners Annemieke and Jason and their teams have put into their restaurants. They set themselves high standards and weren’t satisfied unless those were met day in and day out. And true to themselves, both owners decided to close shop at the top of their game. With their dining rooms still filled with happy guests every night, even in times of economic crisis, Annemieke and Jason decided that it was time to move on, leave troubles with landlords, diners who don’t get the concept of inventive desserts like the chocolate board, or large numbers of no shows behind, and start new exciting projects. Annemieke has actually already moved to France and opened three fantastic apartments for rent, naturally each with a big, fully equipped kitchen. And Jason is working on a new idea to be revealed in 2014. Thank you very much, Annemieke and Jason, good luck with your new projects and please keep us posted! Filed under amsterdam, best amsterdam brunch, best amsterdam restaurants, closed, dutchgrub, restaurant. Posted by dutchgrub	on Tuesday, June 4, 2013 at 14:53. 2 Comments. If you look at a map of Amsterdam, you will see blue everywhere. Amsterdam is a city built around water. Most visitors spend plenty of time around the canals, doing a tour of Amsterdam in a canal boat, shopping in the Negen Straatjes (nine little streets) or just exploring the city. The canals are everywhere. And they represent what Amsterdam stands for – narrow streets lined by century old houses and connected by cobble stone bridges. Most of the restaurants are in this area too and go for a similar vibe. Few visitors ever make it to, let alone over, Het IJ, Amsterdam main water way, situated right behind Central Station, and connecting the city to the North Sea. The Port of Amsterdam lost in importance in the 20th century as it’s far from the North Sea, and lay dormant for years, having been completely neglected by city planners. That’s changing rapidly with many cool apartments springing up by the IJ, as well as several prestigious projects such as the new cruise ship terminal, the EYE movie museum, or the new city library. 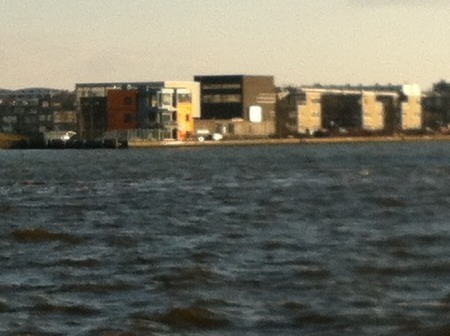 The area has a very different feel than the canals – bigger, more industrial and more diverse. As of recently, a number of restaurants have sprung up in that area, providing diners with that same rather different look – larger, more rugged and more modern. And while many of them are not as conveniently located as the restaurants around the canals, we think it’s well worth a trip to explore this area and feel the pulse of the old Port of Amsterdam. Hotel de Goudfazant is one of dutchgrub’s Trendiest Amsterdam Restaurants. It’s located in an impressive former boat shed where diners sit on long tables and plastic chairs, and enjoy a classic French fixed price menu. Open Tuesday to Sunday 6pm to 1am. Closed on Mondays. 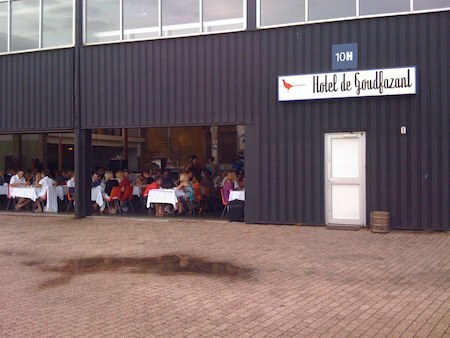 Café Restaurant Stork is housed in a former dock that was stripped but left intact to a large part. It’s very spacious with a big entrance and bar area, an open kitchen and all the fish on display on ice. The menu is a traditional fish and seafood affair with some meat and vegetarian options. De Wereldbol (Dutch for globe) is small and individualistic, run by an ambitious chef with a little help serving and in the kitchen. The menu has a mix of favorites from different parts of the world and a strong focus on aperitifs, wine and desserts. Open Tuesday to Sunday 7pm to 9pm. Closed on Mondays. 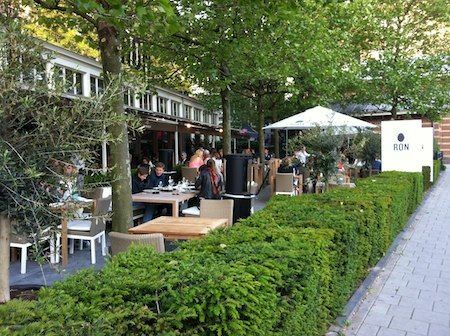 Wilhelmina Dok is the least ambitious of the four food wise but certainly has the most beautiful terrace, overlooking Het IJ with a marvelous view of Amsterdam from the other side. The menu is small but versatile with a meat, fish and vegetarian dish. Open daily from 11am to 11pm. Posted by dutchgrub	on Tuesday, January 15, 2013 at 20:54. 30 Comments. We love getting emails and comments from our readers with questions and suggestions and we do get quite a few. Nonetheless the one we received a while back immediately made our hearts beat faster. It came from a reporter at the New York Times. He and his partner had found Dutchgrub while scoping out restaurants for an upcoming trip to Amsterdam. And liked our recommendations enough to get in touch and suggest lunch together. We had a great time at Gartine, one of our Best Amsterdam Brunch Places, talking about how Dutchgrub started, lunches of sliced bread and slices of cheese from Albert Heijn, our thoughts on the improving Amsterdam restaurant scene and much more. In the end we persuaded them to go to Wilde Zwijnen, a recent addition to our Best Amsterdam Restaurants list. It was great fun, but best of all this all turned into a brilliant article well worth reading: Returning Zing to Dutch Cooking. Filed under amsterdam, best amsterdam brunch, best amsterdam restaurants, dutchgrub, world.